Kelly looks back over the year 2017 and shares her best projects, the most popular podcast episodes, and interesting facts about the listener base. Marsha has a bad cold with a cough--not a good mix with podcasting. The shop is back open after a short break for the Christmas holiday. January 6, 2018: The St. Distaff Day Spin-In at the Evergreen State Fairgrounds in Monroe, from 10 am until 4 pm. Here is a link with further information. January 7, 2018: Seattle Crafternoon starting at 1 pm. Contact us on Ravelry (1hundredprojects or betterinmotion) or email us at twoewes@twoewesfiberadventures.com for location information. February 22-25: Stitches West in Santa Clara. On Saturday afternoon the Yarniacs and 2 Knit Lit Chicks meet-up will be in the hotel lobby of the conference hotel. March 15-18: Edinburgh Yarn Festival in Edinburgh, Scotland. Marsha will be attending and is hoping to meet some of our UK listeners! 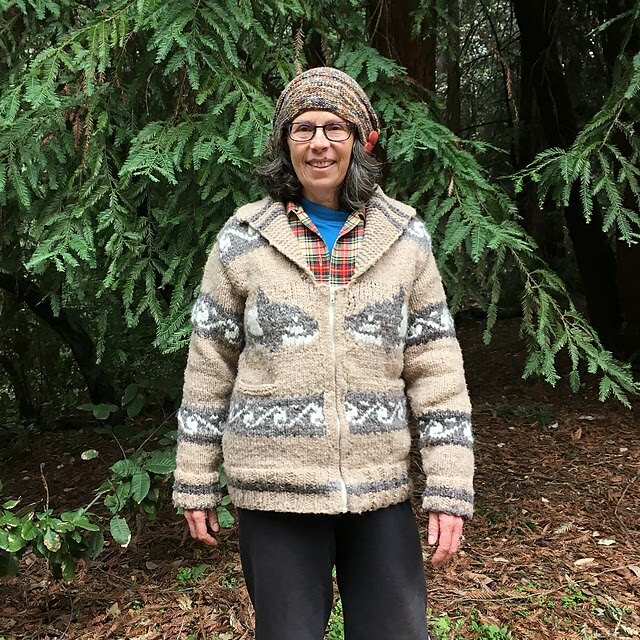 Kelly's project year ended up with 23 finished projects and 5 of them are adult sweaters! A 6th should be finished by the time we ring in the new year. The Handspun Cowichan was finished in time for the camping trip and it was so nice and warm--the perfect camp sweater. This was The Orca Run by Beth Brown-Reinsel. Kelly's camping trip knitting was the blue crochet cardigan that she stalled out on some time ago. 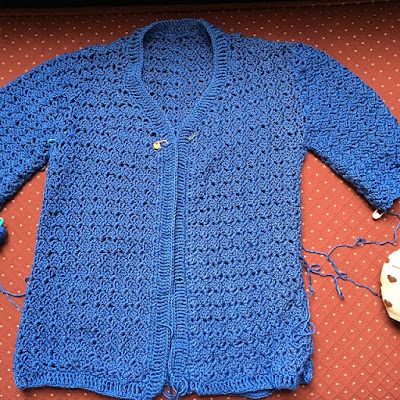 The pattern is The Curious Case of the Crazy-Stitch Cardigan by Michele DuNaier . 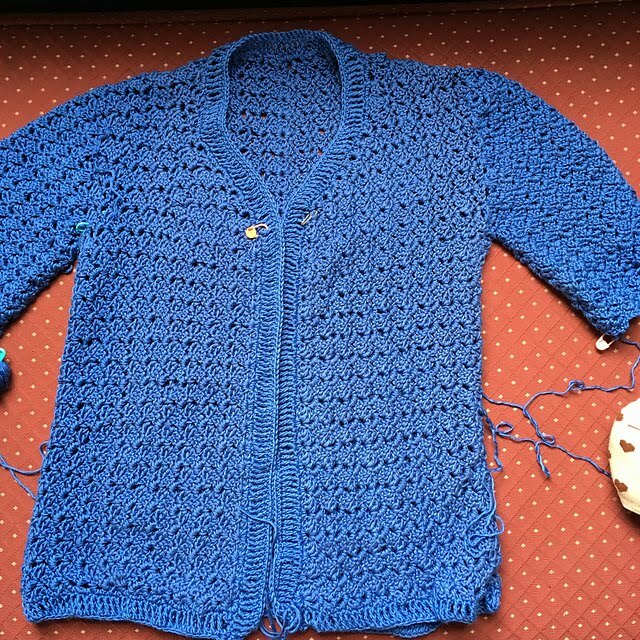 She made great progress and hopes to have a finished sweater by New Year's Day. 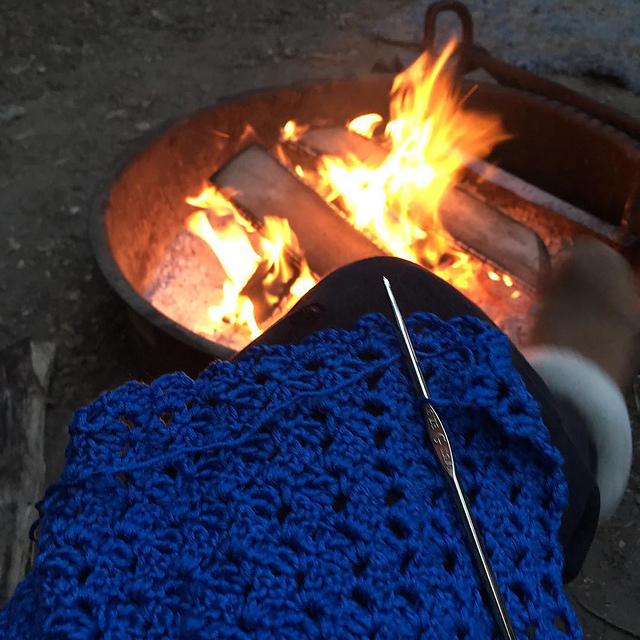 Other camping knitting included a charity hat out of some alpaca spirit yarn. It will be really warm.